Globalisation means exactly that, global control of commerce and trade which means one giant corporation divided up into seemingly separate entities they call government.. In order for such an achievement to become reality the global cartel has to show its hand, today we are experiencing just such a period because if we look, we can see the interconnections of seemingly separate corporate entities working together to a master plan. The main system at the head of the move to global control for the last 5 centuries has been the issuance of currencies by the central banks, currencies issued with an interest charge. The result has been to capture the domestic system of nations via the debt incurred by relinquishing control of the production of money, leading to the incorporation of the executive, right down to local level. This is what we experience today. All aspects of government become facilitators of the corporate script and regulate the end of private ownership, we become serfs in a communist dictatorship. If the government has a change of heart and moves against the policies of the banking cartel, from which the corporations are born, the credit runs out and government has no policy they can implement because they have no cash. Today we are well informed as to the existence of a supranational Committee of men, interconnected through trade, sitting atop the wealth of nations and driving the policies of the same.They are the administrative, manufacturing, mining, and industrial class of nations bound together in self preservation and self promotion.They call themselves the Olympians but to those below are known as the Committee of 300. Let us take a look at a major player in the realm of the committee, important in its ability to ensure the will of the cartel is moved to expansion across the globe. A UK company? BAE is now an international company with five home markets The largest of these is the US, followed by the UK. The others are Australia, India and Saudi Arabia. BAE’s 2010 Annual Report states that it continues to look for further home markets, focusing on South America and Asia. BAE SYSTEMS plc is a global arms company, with interests also in civilian avionics and engineering and is one of the world’s largest arms producers. One of their latest adventures moves them into the health arena specifically London NHS trusts. It makes fighter aircraft, warships, tanks, armoured vehicles, artillery systems, missiles, munitions and much more. BAE’s arms are sold indiscriminately around the world. The company has military customers in over 100 countries and around 95% of its sales are military. Its focus over the past few years has been on increasing sales to the US, specifically targeting equipment for the conflicts in Afghanistan and Iraq, and supplying Eurofighters and other arms to the Saudi Arabia regime. BAE routinely supplies countries the UK Foreign Office Human Rights report considers as having the most serious wide-ranging human rights concerns. British Aerospace (BAe) was first formed as a nationalised corporation in April 1977 by the merger of the British Aircraft Corporation, Hawker Siddeley Aviation, Hawker Siddeley Dynamics and Scottish Aviation. State control over the arms trade didn’t survive for very long under the Thatcher government, however, with the UK Government selling 51.57% of its shares in BAe in 1981, upon its formation as a public limited company (PLC). In 1985, the UK Government sold its remaining shares, keeping only a special £1 share in order to ensure that the company continues under British control (foreign ownership of BAE SYSTEMS is limited by law to 29.5%). At around the same time as it became an entirely privately-owned company, BAe became involved in one of the biggest trade scandals of the 1980s the Al-Yamamah deals with Saudia Arabia. According to the Financial Times, the arms deal (known as Al Yamamah II) was the biggest [UK] sale ever of anything to anyone. The deals were condemned by Amnesty International as a clear endorsement of a country in the hands of a repressive regime who displayed a persistent pattern of gross human rights abuses. BAe was the prime contractor for the entire deal, which included the sale of 48 Tornado bombers, 24 Tornado fighters, 30 Hawk trainer-fighters, and a large number of Rapier missiles. It also involved millions of pounds worth of corrupt commissions paid to Arabian businessmen, which the Conservative government of the time denied. Needless to say, this part of the company’s history does not appear on its own corporate timeline. Meanwhile, in 1988 BAe began to expand its holdings, starting with the acquisition of the Rover group. By 1991 Heckler & Koch GMbh, the German small arms company, had joined them, and in 1992 the company reorganised itself. The arms side of the company were amalgamated into British Aerospace Defence Limited, whereas three new companies were formed to replace British Aerospace (Commercial Aircraft) Limited. These were British Aerospace Airbus Limited, British Aerospace Regional Aircraft Limited and British Aerospace Corporate Jets Limited. As well as internal reorganisation, BAe also began to form alliances with other companies in the arms sector; in October 1993 a joint venture company was formed with GEC-Marconi to manage and develop their involvement in the naval Principal Anti-Air Missile System guided weapons project. This reflected the increasing trend for co-operation between companies in the sector. Undeterred by the outrage and corruption which had mired its arms deals to Saudi Arabia, in November 1996 the Conservative Government handed BAe another morally dubious trade agreement. A large shipment of arms, including 16 Hawk fighter aircraft, was to be sent to the dictatorship that ruled Indonesia, despite widespread suspicion that they would inevitably be used to facilitate the repression of East Timor. As Robin Cook stated in the House of Commons in 1994 Hawk aircraft have been observed on bombing runs in East Timor in most years since 1984. Needless to say, this evidence did nothing to dissuade BAe from extracting the maximum profit available from the deal. The biggest change for BAe came, however, in January 1999, when the company announced its merger with GEC’s Marconi Electronic Systems business (essentially the arms dealing side of GEC Marconi). In November 1999, the two businesses merged, creating a new corporate entity named BAE SYSTEMS, which became the largest arms dealer in the world. All was not necessarily rosy with the new company, however, with a profits warning issued on January 10, 2001, wiping away a quarter of the company’s value on the stockmarket. New developments have, however, made the company’s future look bright. The British Government continues to look after its corporate friends, with the recent £28 million sale of a military air-traffic control system to debt-stricken Tanzania causing outrage among ordinary voters. As Justin Forsyth, Oxfam’s head of policy, has put it: It is outrageous that Tanzania’s debt relief will go towards bolstering the profits of BAE and Barclays bank rather than helping the poor people of Tanzania. On top of this, the British government is currently mounting an intensive campaign to sell 60 Hawk jets, worth £1bn, to India. This is despite the danger of the India-Pakistan dispute over Kashmir spilling into war and destabilising the entire region. 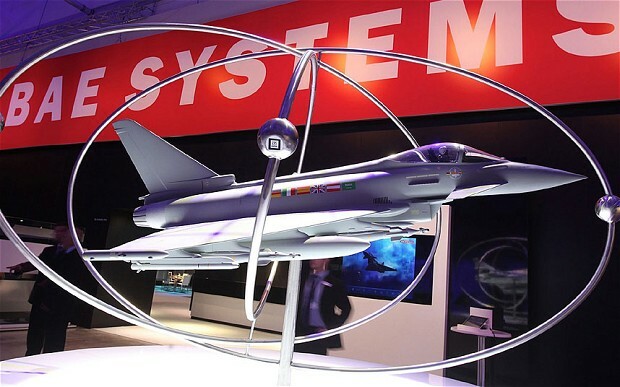 BAE SYSTEMS has already sold Jaguar combat aircraft to India in licensing deals that the Ministry of Defence (MoD) refuses to disclose (see Corporate Crimes section). External factors have also helped to secure BAE’s future most notably the fallout from the attack on the World Trade Centre on September 11th, 2001. The War on Terrorism cannot fail to boost BAE’s profits, and as the Board of BAE point out in their preliminary results for 2001, the loss of revenue from civilian aeronautics will be mitigated by the overall improvement in performance in other business groups. In other words, the fall in civilian air traffic doesn’t matter to BAE SYSTEMS, because they will continue to profit from the spiral of death and destruction which constitutes the arms trade. The outlook is bright for this company only when it is bleak for the rest of the world. Despite an increase in share prices and a generally good outlook for the company, on Tuesday March 26th, 2002, a boardroom coup shocked The City. This lead to the departure of CEO John Weston, who had been with the company for more than 30 years. It has been suggested that his style clashed with the Chairman of the Board of Directors, Sir Richard Evans, and that the Ministry of Defence (MoD) resented being bullied by Weston. As the Observer put it: Weston had irritated Defence Secretary Geoff Hoon by his opposition to the Government’s defence procurement process Weston has sometimes been criticised for adopting a robust attitude when dealing with officials. Whatever the reason, Mike Turner (formerly Chief Operating Officer) was quickly promoted to the vacant CEO spot, and The City expects more changes to occur soon, not least in the orientation of the company. Rather than a single focus on the United States, it is thought that Turner will concentrate on keeping the activities of BAE diversified, and on rebuilding relations with the MoD. BAE SYSTEMS aims to be a truly global systems, defence and aerospace company with unrivalled capability the] prime contractor and systems integrator for our customers, in the air, land, sea, and space. As such, the company has interests in areas spanning the range of avionics and defence systems, from hardware manufacture to personnel training. Primarily, however, BAE is an arms company, ranking first in the world in terms of arms sales. Military equipment currently accounts for around 75% of the companies total sales. In 2000 it pulled in $13,248 million in military revenue. It is the world’s fourth largest defence and aerospace firm, behind Boeing, Lockheed Martin, and EADS. The company is a significant employer, directly employing over 100,000 people. Over a third of its workforce is outside the UK in the US, Saudi Arabia, France, Italy, Germany, Sweden, Australia & Canada. BAE SYSTEMS is present in five continents, with customers in 129 countries, and its order book at the end of the year 2000 totalled £41 billion. Its biggest rivals are the US companies Lockheed Martin and Boeing, as well as the European syndicate EADS Inc, which formed when BAE acquired GEC. In theory, BAE SYSTEMS is financially strong enough to attempt a takeover of its rivals. However, BAE SYSTEMS ambition to merge with Boeing or Lockheed has been ruled out by the US government. Nevertheless, its desire to break into the US market, by far the largest in the world for arms companies, continues unabated. Corruption Investigations In 2004, following compelling evidence in the media, the UK’s Serious Fraud Office (SFO) began investigating BAE deals with countries including Saudi Arabia, South Africa, Tanzania and the Czech Republic. However, in 2006 Tony Blair quashed the SFO investigation into BAE’s multi-billion pound and corruption-riddled deals with Saudi Arabia, one of the world’s most authoritarian regimes. A US Department of Justice (DoJ) investigation into multiple deals including those with Saudi Arabia, continued. In early 2010, the DoJ agreed a plea bargain with BAE. The company was sentenced to pay a $400 million criminal fine, one of the largest criminal fines in the history of DOJ’s ongoing effort to combat overseas corruption in international business and enforce U.S. export control laws. This covered corruption on arms deals with Saudi Arabia, the Czech Republic and Hungary, although BAE only had to admit to making false statements in regulatory filings. The SFO was left with, as Private Eye referred to it, the crumbs of a £30m settlement over BAE’s corrupt Tanzanian radar system contract  In this instance, BAE only had to admit to false accounting. More information on the investigations and plea bargains, including links to relevant documents is available here. Despite its ability to coerce the UK Government, BAE SYSTEMS also belongs to several lobbying groups. The company is prominent in the TABD (Trans-Atlantic Business Dialogue), which is a trans-continental business lobbying group, which describes itself as a unique business-led process launched by the EU and US in 1995, [which] seeks to reinvigorate our economies by increasing transatlantic trade and investment opportunities through the removal of costly inefficiencies from excessive regulation, duplication and differences in EU and U.S. regulation. As anyone conversant with corporate speak will know, what this actually means is that the TABD is dedicated to eliminating all regulation which stops profit-making activity, regardless of its worth or importance; environmental regulations, labour standards and nationally owned public services have all come under attack from the TABD. Tellingly, the CEO of BAE, Mike Turner, is to be one of two co-chairs of the organisation for this year (2002). BAE SYSTEMS is also a member of the International Chamber of Commerce (ICC). This organisation describes itself as the World Business Organisation, and has similar neo-liberalist aims to the TABD.. The European based research group, Corporate Europe Observatory, has this to say about the ICC: The ICC has a long history of vigorously lobbying to weaken international environmental treaties Examples include the Kyoto Protocol, the Convention on Biodiversity, and the Basel Convention against trade in toxic waste. In all of these UN negotiations, the International Chamber’s obstructive lobbying is in direct opposition to the Global Compact [a UN pledge for transnational corporations] principles it has pledged to pursue. BAE also belongs to SBAC (Society of British Aerospace Companies), and, as by far the largest member, exercises a lot of power. John Weston, their ex-CEO, is currently President of SBAC. It seems unlikely that control of SBAC is very important to BAE however, given its own direct links to Government and the House of Commons. BAE SYSTEMS is also looking after its future recruitment and public relations by moving into the educational sector. BAE SYSTEMS has developed its PR machine far in advance of the traditional careers fair stall and occasional brochure. In 1998 it set up its virtual university, which awards Certificates in Management, supported by Lancaster and the Open University. BAE keeps expanding its virtual university, which is also supported by the Engineering and Physical Sciences Research Council (EPSRC). The EPSRC is the largest of the seven UK Research Councils. It funds research and postgraduate training in universities and other organisations throughout the UK. The UK research councils claim to be autonomous, non-departmental public bodies. However, they are funded from the science budget received from the Office of Science and Technology (part of the Government’s Department of Trade and Industry). So basically, the Government is funding research and training conducted for arms manufacturers through the EPSRC. In addition to the virtual university, BAE SYSTEMS has partnerships of varying natures with many other universities, cooperating with Sheffield Hallam in the production of curriculum materials, and having research partnerships with Cambridge, Sheffield and Southampton Universities, amongst others. It also sends many of its young engineers back into secondary schools, to extol not only the benefits of an engineering career, but one with BAE SYSTEMS. In addition, the company has sponsored various events and educational displays, such as the Mind Zone in the Millennium Dome, further linking its name with scientific and engineering excellence, and avoiding its real business of manufacturing weapons to kill people. Having capital far in excess of any other UK engineering firm (partly because of its size, and partly because of its massive reserves from the Al-Yammamah deal) it offers extremely rewarding packages to the best UK engineering students, ensuring that the arms industry continues to leech off the most promising talents in the sector.